When it comes to our work, we like being progressive and pushing the envelope with the latest and greatest trends. However, when we get home, we prefer the classics. For us, the simple beauty of beadboard takes us back to summers at Grandma’s cottage or trips to the Gulf Coast. It’s a clean look that provides a certain pop of personality that hits just the right note. And while you’ve probably seen it on walls before, today we’re looking at some creative ways to bring on the beadboard! If you don’t have a backsplash already, you’re really going to thank us. If you already have one, but it’s more bore and less splash, you can thank us as well. We love the simple addition of beadboard for a kitchen backsplash. Let’s be honest, the kitchen sink is a messy place; make sure your walls aren’t taking the beating from the mess. Bonus Tip: angle the beadboard to create a herringbone effect. Staying in the kitchen, is it time for a cabinet upgrade? If you’re like us, there’s nothing worse than being bored with your decor. 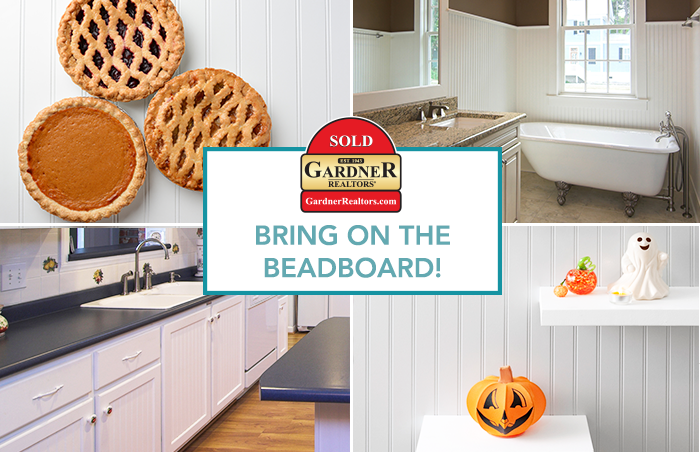 One way to spruce things up is to give your cabinets the beadboard overhaul. With just a few tools and a tube of wood glue, your cabinet doors will be singing the coastal cottage tune in no time! Often overlooked, but you can change the whole vibe of a room/house by updating the stairs. Are yours a carpeted design of the past? Move on to the future with a classic, yet modern look. We suggest making a project of it by ripping up the old carpet (if you have any), staining the stairs a dark wooden color and adding beadboard to the back of each stair. You’ll have a fresh new look that will make you feel like Cinderella at the ball. One of our favorite beadboard upgrades is in your tub. If you’re lucky, you spend a good amount of time in there relaxing, so it might as well look as good as you feel! Make sure you choose a waterproof material or seal the wood to ensure that it will last for many, many baths. You’ll love the way this gives your tub that “built-in” look! Look up. What do you see? Does your house have that old popcorn-style roof? Do you want a simple makeover? Add beadboard to your ceiling and completely overhaul the look and feel of your room. Each night when you lay down for bed, you’ll smile looking up at your brand new ceiling. New Orleans tip: a lot of you probably have this on your front porch ceiling. And odds are, it’s painted bright blue, an old NOLA trick to ward off evil spirits! We’re local. We’re global. As an affiliate of Leading Real Estate Companies of the World® and Luxury Portfolio International®, GARDNER REALTORS has connections to the very best real estate brokers all around the world who are ready to help you with all of your real estate needs!